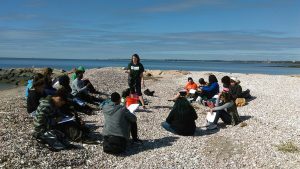 Sharon Brostrom graduated from Southern Connecticut State University in 2007 with a Bachelor’s degree in Earth Science and completed her Master’s degree in Environmental Science Education in 2015. She had taught nine years before coming to Common Ground in 2015. Sharon teaches Biodiversity, Environmental Science, AP Environmental Science, and Oceanography. She is also the crew leader of the West River Stewards and advises the Envirothon club. When not teaching, she enjoys reading, gardening, kayaking, and spending time with her family. Contact her by email at sharon.brostrom@commongroundct.org.